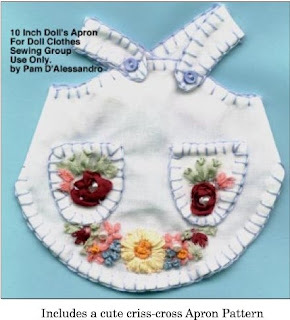 This pattern is made for the Ann Estelle 10 inch dolls, but it could fit any of the 10-11 inch dolls that you have. I have included a picture of the buttonhole stitch since this pattern looks adorable embroidered. You can always purchased trim if you want. Make your outfit in a solid dress and then use a patterned fabric to make the apron for a different look. There are many ways you can use this pattern! This free pattern is an E-Pattern so please email me at pamamom@gmail.com if you would like a copy!